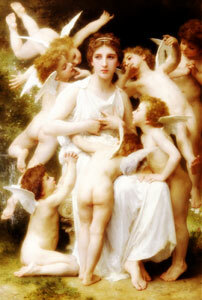 There are different groups of angels, that all have their specific tasks. But what they all have in common is to support and guide all human beings on their way through existence. They are walking with us patiently through our daily life and, if we leave the right path, they whisper us helpful words into our hearts. They inspire us in times of helplessness, soothe us in times of misery, and enjoy with us in times of happiness. They are like children, pure and kind, playful and full of love and devotion for us humans.